Candidates have to apply for the Application form that is available on the college's official website. 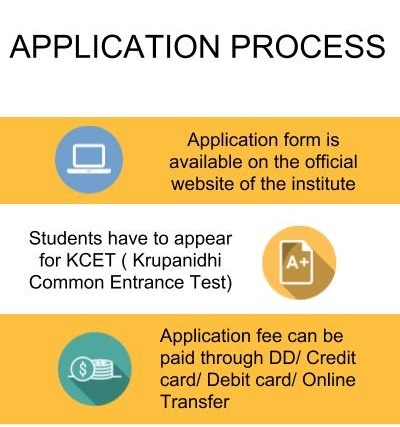 Applicants have to appear for KCET (Krupanidhi Common Entrance Test) which is based upon aptitude, reasoning, data analysis, mathematical skills, language comprehension, and general knowledge. They also have to appear for any nationally based entrance examination and should attach their Entrance Examination Scorecard along with the application form. The application fee is worth Rs. 1000/- and has to be submitted along with application form. it can be paid as DD/ cash/ credit card/ debit card/ online transfer. Candidates once have done with the submission of application form, application fee and the scorecard of Entrance Examination they have to undergo the admission process. Selection of candidates is primarily based upon the entrance examination and academic qualification of the candidate. 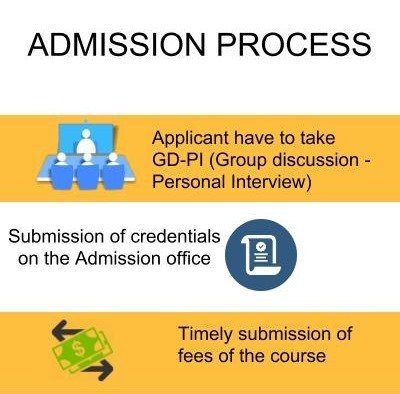 Students have to undergo a GD-PI (Group discussion - Personal interview) to move further on the process of admission and help in shortlisting the candidates. Then, the students have to submit their credentials on the admission counter. Timely submission of fees is expected from all selected candidates. Students should obtain in 10+2 and bachelor's degree (in any discipline) with a minimum aggregate of 50% marks are eligible to apply in Krupanidhi School of Management, Bangalore admission 2019. Applicants who are appearing for the final-year degree examination can also apply for the same. A student applying to KSM for MBA must have a valid CAT / GMAT / IIFT / XAT / MAT / ATMA / CMAT percentile which is All India Aptitude/entrance test and submit the photocopy of scorecard along with filled application form. Candidates should obtain a minimum aggregate of 50% marks in their 10+2 and undergraduate degree are eligible to apply. Applicant should have a valid CAT/GMAT/IIFT/XAT/MAT/ATMA/CMAT percentile which is All India Aptitude/entrance test and submit the photocopy of scorecard along with filled application form. Candidates should obtain a minimum aggregate of 50% marks in their 10+2 and undergraduate degree are eligible.